These 15 new hymns and Mass parts will find a home wherever the liturgy is celebrated in Spanish. 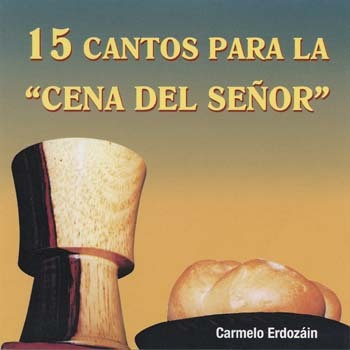 15 Cantos para la Cena del Señor (15 Songs for the Lord's Supper) is just one of the collections from Father Erdozáin, the celebrated priest and composer from Navarre, Spain. A prolific writer, he now has around 30 collections of liturgical music to his credit. These 15 hymns and Mass parts will find a home wherever the liturgy is celebrated in Spanish. The collection includes "El Señor Nos Invita," a Communion song that was selected to be the title song in OCP's new Spanish-language children's resource. The CD includes five instrumental tracks. 15 Cantos para la Cena del Señor (15 Songs for the Lord's Supper) is the latest release from Father Erdozáin, the celebrated priest and composer from Navarre, Spain. A prolific writer, he now has around 30 collections of liturgical music to his credit. These 15 new hymns and Mass parts will find a home wherever the liturgy is celebrated in Spanish. The collection includes "El Señor Nos Invita," a Communion song that was selected to be the title song in OCP's new Spanish-language children's resource. The CD includes five instrumental tracks. 15 Cantos para la Cena del Señor (15 songs for the Lord’s supper) is the latest release from Father Erdozáin, the celebrated priest and composer from Navarre, Spain. A prolific writer, he now has around 30 collections of liturgical music to his credit. These 15 new hymns and Mass parts will find a home wherever the liturgy is celebrated in Spanish. The collection includes “El Señor Nos Invita,” a Communion song that was selected to be the title song in OCP’s new Spanish-language children’s resource. The CD includes five instrumental tracks.